But if one shall say, that by that law we are only forbid to kill any except when the laws of the land allow of it, upon the same grounds, laws may be made, in some cases, to allow of adultery and perjury: for God having taken from us the right of disposing either of our own or of other people’s lives, if it is pretended that the mutual consent of men in making laws can authorise man-slaughter in cases in which God has given us no example, that it frees people from the obligation of the divine law, and so makes murder a lawful action, what is this but to give a preference to human laws before the divine? The existence of a written law, fully complied with, does by no means guarantee justice or truth. It’s interesting when people agree in law-making, but not convincing. This entry was posted in Ethics, Social issues and tagged Law on 8 January, 2014 by Chris. Romans 7 is astoundingly moving. Paul speaks of an awful internal conflict: loving right while doing wrong. Romans 7 is also a bit tricky. Exactly who is the person feeling this internal conflict? Is it a Christian? Perhaps it’s a Jewish person who loves the law but does not yet trust Jesus. Or someone else altogether. I’m not trying to solve that here! I want to make a smaller observation – knowing that getting the details clear will help us eventually answer the bigger questions. My observation is this: in Romans 7, Paul is at pains to honour the goodness of God and God’s law. 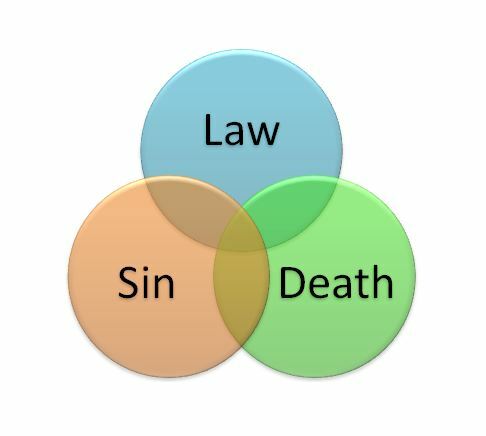 It’s clear there’s a relation between God’s law, and sin in us, and death. But what kind of relationship? If we err in answering this question, the mistake will lead us into danger. I believe avoiding serious error is part of Paul’s concern in this chapter. Hence, Paul excludes: he rules out two wrong relationships in these three terms. Check out his questions. We cannot say that God’s law is sin. 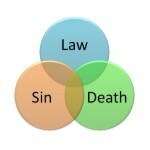 There is a link between sin and law. It’s a relationship not easy to put into words. In Romans 8:3, Paul speaks of the law as ‘weakened’ by the flesh. From 7:7, we could say that sin is ‘enlivened’ by the law. But whatever we say, we never have reason to say the good law from God is sin. Likewise, we cannot say that God’s law becomes death. Death is not the overflow of God’s law. Death is the overflow of sin. As with Adam, it’s sin that leads to the judgement of death (see Rom 5:12-14). So the law is holy, and the commandment is holy, righteous and good. This entry was posted in Bible and tagged Death, Law, Romans 5:12-14, Romans 7, Romans 8:3, Sin on 17 April, 2013 by Chris. In Albury-Wodonga, the weekly free newspapers used to include a column of reflections. They were written by local ministers, or similar (authors included a local Baha’i leader, as well as someone from the local humanist society branch). I don’t know why they stopped. Equally, I don’t know if they achieved anything! Cleaning up my computer, I found a few of mine. In the interests of recycling, I will re-release them on this blog. What would happen? Two things would result, I am sure. Firstly, the jokes would reduce. No one wants to be caught out! Secondly, and most importantly, people would harbour a grudge about ‘lefties.’ That is, men and women may stop making fun but would still resent them. People are tenacious and hold on tightly to even the most irrational convictions. Laws are important. I hope that Australia’s laws become better and better. But this imaginary situation illustrates the great weakness of law: it cannot change the heart. For example, Australia has laws against racial discrimination. Yet we all know that some people still hate those of a different skin colour. That’s a good law – but the good law does not change the heart. A stony heart will remain dead and unresponsive. There’s a mistaken idea I come across repeatedly: that Christians are all about laws. No! Christianity is about the heart of men and women. The Bible shows that God does what national laws cannot do. God can take a stony heart and give it life. Where we distrust our neighbour God alone can move us to love. Where we give God himself the cold shoulder treatment God alone can bring us back to himself. So let’s think wisely about life in Australia. Let’s support the best efforts of those who make laws. But let’s also remember that the problem of our hearts of stone can only be solved by what God does through Jesus Christ. This entry was posted in Christian living, Christianity & culture, Social issues and tagged Ezekiel 26:36, Heart, Law, Racism, Reflections column on 15 November, 2012 by Chris.